Until the 1960s, the National Weather Service often discovered tornadoes by reading newspaper reports of their destruction. Around the same time, a teen-aged Greg Forbes was making backyard weather predictions with a rain gauge and thermometer. 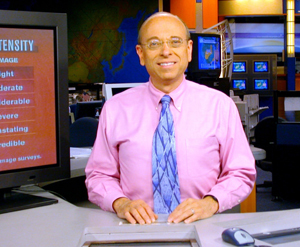 Severe-weather expert Greg Forbes prepares Weather Channel viewers for the worst. Like the severe weather he studies, Forbes’s career cuts a wide swath. He has surveyed the damage paths left by 300 tornadoes and windstorms, among them Hurricane Andrew and Typhoon Paka, which devastated several Pacific islands in 1997; measured the North Polar ozone hole as a NASA project forecaster; and collaborated with national weather services in South Africa, Spain, and the Netherlands. To get there, Forbes left his backyard studies behind in 1968 to pursue a degree from Penn State, one of the country’s largest meteorological schools. For graduate studies, he sought out Chicago and meteorologist Tetsuya Theodore (“Ted”) Fujita, who, in 1971, had just established the Fujita Scale (F-scale) for rating the wind speeds of tornadoes by examining the damage they cause. Forbes used the F-scale and Fujita’s hypothesis of tornado substructure—suction vortices that revolve about the parent tornado—in his dissertation on the 1974 Super Outbreak, a stunning series of 148 tornadoes that struck from the Great Lakes to the Gulf of Mexico. As technology advanced, Forbes and “Mr. Tornado” (a moniker Fujita enjoyed) worked together to explore ways to use newly launched satellites. For example, they flew Lear jets behind thunderstorm tops, the highest parts of the thunderstorm that bulge as a dome above the flatter thunderstorm anvil, to monitor thunderstorm behavior and determine any correlation between what the tops did and the severe weather they produced. As early as 1974, structural engineers doing damage surveys began to question the wind-speed categories of the F-scale. Too high, they said. By the 1980s and ’90s, they were certain that structural weaknesses—houses not built well, building codes that only require structures to sustain winds as low as 75 mph—contributed to the damage as much as the wind. Even Fujita had come to realize the scale needed adjusting. After Fujita died in 1998, an engineering group from Texas Tech convened what they dubbed the Expert Elicitation Process, an elite group of three engineers and three meteorologists, including Forbes. They developed the Enhanced Fujita Scale (EF) with considerably lower wind speeds. The EF just weathered its first tornado season in 2007, and Forbes does not anticipate any major changes. As for predicting the effects of global warming, Forbes is cautious. For one thing, tornado counts are skewed by a dramatic increase in reporting. The combined efforts of storm chasers and Doppler radar have increased annual tornado reports from about 300 in 1950 to more than 1,000 now.